All rates will be charged in $FJD and are exclusive of government taxes and charges. US Dollars are indicative only. Berthing payments are not berth specific. Vessels with a beam 16’ and over are charged 150% of the above inwater berthing rates and vessels with a beam 24’ and over are charged 200% of the above inwater berthing rates. Weekly and monthly rates only available if paid in advance. Failure to pay in advance will result in daily rate being charged until paid up to date. Invoices not paid after 30 days will incur a 7.5% late payment fee until fully paid. Free power is limited to normal supply through a 10amp plug. Aircon units or power tools subject to review by Marina management. * Pay in full for your cyclone season pit before 31st March & receive 20% off * A non-refundable deposit of $1,500 is required to secure a pit. * All cyclone season pits must be paid in full by 15th September or they will be offered to the next yacht on the waitlist. * Yachts in the pits during Sailing Season MUST be removed by 15th October. 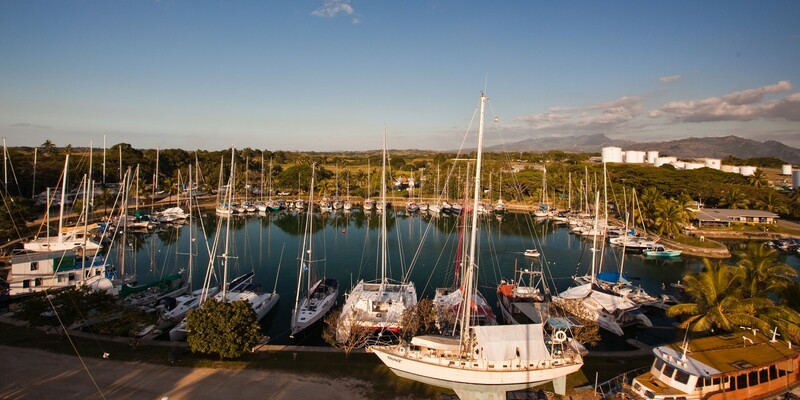 * Additional stays less than 1 month during sailing season are charged at daily hardstand rate.